Maya / Maaya is mentioned around 61 times in Mahabharata. Thus Mahabharata contains the largest reference to Maya. Here one Maya belonging to the Maya tribe is praised as a great architect and creator of many technological illusions. Another Maya is credited with the creation of space-crafts rotating around Earth in precise orbits. 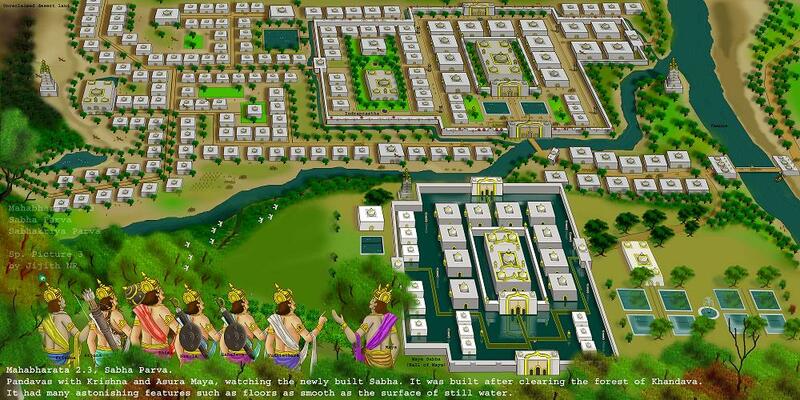 One architect Maya constructed a wonderful assembly for the Pandava king Yudhisthira. He was respected by the king as a great man. Like in Ramayana, in Mahabharata too there is varying references that make Maya a Daitya or a Danava, but undoubtedly and Asura. Mahabharata also contains references to a battle between Indra and Maya, where Indra defeated or killed Maya. This corroborate with some of the references in Rig Veda where a battle between Indra and Gandharva is mentioned. The designation 'Gandharva' in this case may be point to the location of this Maya's territory in Gandhara region (north-western Pakistan). (Mbh.1.55) Like the sacrifice of Maya, of king Sasavindu, or of king Vaisravana, of the sacrifice of Nriga, of Ajamida, of the son of Dasaratha, is this sacrifice of thine O son of Parikshit. Chapter 229 of the Book 1 (Adi Parva) of Mahabharata gives the detail account of how one architect belonging to the Maya tribe became a friend of the Pandavas. Due to the enormity of the narration it is described in a summary here:- Danava Maya (around 3100 BCE) was dwelling in the territory of Naga king Takshaka called the Khandava (modern day Delhi and its surroundings). He was there to construct some buildings for Takshaka. Since the territory of Naga Takshaka was a threat for the newly created city of the Pandavas, viz. Indraprastha (now the Delhi city), Arjuna (brother of King Yudhisthira ruling at Indraprastha) and his friend Krishna decided to burn the Naga settlements at Khandava. While the territory was thus burned, Maya sought the protection of Krishna and Arjuna. They gave him protection and did not slay him. In return Maya asked what he shall do for them. Then Krishna said:- "Let a palatial Sabha (meeting hall) as thou choosest, be built by thee, if thou, O son of Diti, who art the foremost of all artists, desirest to do good to Yudhishthira the just (Mbh.2.1)". Having heard those words, Maya became exceedingly glad. Then Krishna and Arjuna after having narrated everything unto king Yudhishthira the just, introduced Maya unto him. Yudhishthira received Maya with respect, offering him the honour he deserved. Maya accepted that honour thinking highly of it. (2.3) Then Maya Danava addressed Arjuna, that foremost of successful warriors, saying, I now go with thy leave, but shall come back soon. On the north of the Kailasa peak near the mountains of Mainaka, while the Danavas were engaged in a sacrifice on the banks of Vindu lake, I gathered a huge quantity of delightful and variegated vanda a kind of rough materials composed of jewels and gems. This was placed in the mansion of Vrishaparva. There is also, I think, a fierce club placed in the lake Vindu by the King of the Danavas after slaughtering therewith all his foes in battle. Besides being heavy and strong and variegated with golden knobs, it is capable of bearing great weight, and of slaying all foes, and is equal in strength unto an hundred thousand clubs. It is a fit weapon for Bhima, even as the Gandiva is for thee. There is also in that lake a large conch-shell called Devadatta of loud sound, that came from Varuna. I shall no doubt give all these to thee. Having spoken thus unto Partha, the Asura went away in a north-easterly direction. On the north of Kailasa in the mountains of Mainaka, there is a huge peak of gems and jewels called Hiranya-sringa. Near that peak is a delightful lake of the name of Vindu. Maya brought back the club and the conch-shell and the various crystalline articles that had belonged to king Vrishaparva. And the great Asura, Maya, having gone thither, possessed himself of the whole of the great wealth which was guarded by Yakshas and Rakshasas. Bringing them, the Asura constructed therewith a peerless palace, which was of great beauty and of celestial make, composed entirely of gems and precious stones, and celebrated throughout the three worlds. He gave unto Bhimasena that best of clubs, and unto Arjuna the most excellent conch-shell at whose sound all creatures trembled in awe. The palace that Maya built consisted of columns of gold, and occupied an area of five thousand cubits. The palace, possessing an exceedingly beautiful form, like unto that of Agni or Suryya, or Soma, shone in great splendour, and by its brilliance seemed to darken even the bright rays of the sun. And with the effulgence it exhibited, which was a mixture of both celestial and terrestrial light, it looked as if it was on fire. Like unto a mass of new clouds conspicuous in the sky, the palace rose up coming into view of all. Indeed, the palace that the dexterous Maya built was so wide, delightful, and refreshing, and composed of such excellent materials, and furnished with such golden walls and archways, and adorned with so many varied pictures, and was withal so rich and well-built, that in beauty it far surpassed Sudharma of the Dasarha race, or the mansion of Brahma himself. And eight thousand Rakshasas called Kinkaras, fierce, huge-bodied and endued with great strength, of red coppery eyes and arrowy ears, well-armed and capable of ranging through the air, used to guard and protect that palace. Within that palace Maya placed a peerless tank, and in that tank were lotuses with leaves of dark-coloured gems and stalks of bright jewels, and other flowers also of golden leaves. And aquatic fowls of various species sported on its bosom. Itself variegated with full-blown lotuses and stocked with fishes and tortoises of golden hue, its bottom was without mud and its water transparent. There was a flight of crystal stairs leading from the banks to the edge of the water. The gentle breezes that swept along its bosom softly shook the flowers that studded it. The banks of that tank were overlaid with slabs of costly marble set with pearls. And beholding that tank thus adorned all around with jewels and precious stones, many kings that came there mistook it for land and fell into it with eyes open. Many tall trees of various kinds were planted all around the palace. Of green foliage and cool shade, and ever blossoming, they were all very charming to behold. Artificial woods were laid around, always emitting a delicious fragrance. And there were many tanks also that were adorned with swans and Karandavas and Chakravakas Brahminy ducks in the grounds lying about the mansion. And the breeze bearing the fragrance of lotuses growing in water and of those growing on land ministered unto the pleasure and happiness of the Pandavas. And Maya having constructed such a palatial hall within fourteen months, reported its completion unto Yudhishthira. Having searched the southern region with all its hills, forests, and mines for some time, we became very weary. At length we beheld a great cavern. We entered that cavern which extended over many Yojanas. It was dark and deep and overgrown with trees and infested by worms. And having gone a great way through it, we came upon sun-shine and beheld a beautiful palace. It was the abode of the Daitya Maya. And there we beheld a female ascetic named Prabhavati engaged in ascetic austerities. And she gave us food and drink of various kinds. And having refreshed ourselves therewith and regained our strength, we proceeded along the way shown by her. At last we came out of the cavern and beheld the briny sea, and on its shores, the Sahya, the Malaya and the great Dardura mountains. And ascending the mountains of Malaya, we beheld before us the vast ocean And beholding it we felt sorely grieved in mind. The narration matches with those found in Ramayana except that the name of the guardian of the palace was mentioned as Prabhavati (the glowing one) instead of Swayamprabha (the self glowing one). From the narration and geography described, Maya's abode was somewhere close to Kanyakumari (the southern tip of India), with sea-shore (Indian ocean) and mountains (Malaya, Sahya) nearby in Tamilnadu-Kerala boarder. This is a dialog between sage Narada and Matali, the chariot driver of Indra. They were looking for a bride for Matali's son Gomukha. For details see The city of Hiranyapura. Here in these regions called Patala is that spacious and celebrated city of cities, called Hiranyapura, of the Daityas and Danavas, possessing a hundred diverse kinds of illusion. It hath been built with great care by the divine artificer, and planned by the Danava Maya. Many Danavas lived here, exhibiting a thousand different kinds of illusion. They were incapable of being vanquished by Sakra (Indra) or any other celestial. Here dwell, Those Asuras called Kalakhanjas and those Rakshasas also called Yatudhanas. All of them are endued with frightful teeth, terrible impetus, the speed and prowess of the wind, and great energy depending on powers of illusion. Besides these, another class of Danavas called Nivatakavachas, who are invincible in battle, have their abode here. Thou knowest how Sakra is unable to vanquish them. Many times, O Matali, thou, with thy son Gomukha, and Indra with his son, had to retreat before them. Behold their homes, O Matali, that are all made of silver and gold, and well-adorned with decorations done according to the rules of art. All those mansions are decked with lapis lazuli and corals, and made effulgent with the lustre of the Arka-sphatika (solar-glass), and the radiance of gem called Vajrasara. And many of those palatial residences seem, as if, they have been made of the shine of these gems called Padmaragas, or of bright marble, or of excellent wood. And they are also possessed of the radiance of the sun, or blazing fire. And all the edifices, adorned with gems and jewels, are very high and stand close to another. Of spacious proportions and great architectural beauty, it is impossible to say of what material these mansions are built or to describe their style of beauty. Indeed, they are exceedingly beautiful in consequence of their decorations. Behold these retreats of the Daityas for recreation and sport, these beds of theirs for sleep, these costly utensils of theirs set with precious stones, and these seats also for their use. Behold these hills of theirs, looking like clouds, those fountains of water, these trees also that move of their own will and that yield all fruits and flowers that one may ask. Here when Narada asks Matali to search for a bride, Matali replied:- "It behoveth me not to do anything that may be disagreeable to dwellers of heaven. The Devas (gods) and the Danavas, though brothers, are ever at hostility with each other. How can I, therefore, make an alliance with those that are our enemies?" This vindicates our analysis that the Daityas, Danavas and Devas shared close kinship. As a corroboration of the battles mentioned in Rigveda between Maya and Indra we have some of them mentioned in Mahabharata, Bhishma Parva (Book 6):- (6.101) Routing that large army and causing many mighty car-warriors to tremble, he gladdened his friends like Vasava gladdening the celestials after vanquishing Maya. (6.102) The son of Subhadra then, in that battle, with his straight shafts, obliged the Rakshasa to turn his back upon the field, like Sakra repulsing Maya in days of old. (6.111) And they encountered each other in dreadful battle like Maya and Sakra in days of old. This is also repeated in Drona Parva (Book 7), where the battle is mentioned as between Maya and Vishnu:- (7.172) Seizing then that gigantic prince of Rakshasas, viz, Alamvusha, who thus struggled with him, he pressed him down on the earth, like Vishnu slaying the Asura Maya in battle. In Shalya Parva (Book 9) Bhima and Duryodhana about to commence a dual fight with mace is compared to Indra and Maya (9.53). The three Daityas, sons of Asura Taraka (the one belonging to the stars) named Tarakaksha (the star-eyed one), Kamalaksha (the lotus-eyed one) and Vidyunmalin (the one adorned with electricity) asked Danava Maya, who was respected by Daityas and Danavas alike, to make three space-cities for them. Then Maya, of great intelligence, by the aid of his own ascetic merit, constructed three cities, one of which was of gold, another of silver, and the third of black iron. The golden city was set in heaven, the silver city in the welkin, and the iron city was set on the Earth, all in such a way as to revolve in a circle. Each of those cities measured a hundred yojanas in breadth and a hundred in length. And they consisted of houses and mansions and lofty walls and porches. And though teeming with lordly palaces close to each other, yet the streets were wide and spacious. And they were adorned with diverse mansions and gate-ways. Each of those cities had a separate king. The beautiful city of gold belonged to the illustrious Tarakaksha: the silver city to Kamalaksha, and the iron one to Vidyunmalin. Maya became the supplier of every thing they wanted. Whoever amongst those residing in the triple city wished for any object in his heart had his wish fulfilled by Maya aided by the latter's powers of illusion. Hari, son of Tarakaksha, created a lake in his city that was capable of reviving the dead. In whatever form and whatever guise a Daitya might have been slain by means of weapons, if thrown into that lake, he was restored to life, in the self-same form and guise and with redoubled strength. The Asuras in these cities began to shamelessly exterminate the cities and towns established all over the universe. Sakra, surrounded by the Maruts, battled against the three cities by hurling his thunder upon them from every side. However, Purandra failed to pierce those impenetrable cities. The cities were finally destroyed by Siva with a single projectile weapon shot from Earth, while they came aligned in a straight line, while in their respective circular orbits:- (8.34) Then Sarva, having stringed his bow and aimed that shaft with which he had united the Pasupata weapon, waited thinking of the triple city. The three cities during that time became united losing their separate characters. Siva, then drawing that celestial bow, sped that shaft which represented the might of the whole universe, at the triple city. They began to fall down towards the Earth. Burning those Asuras, he threw them down into the Western ocean. Mahabharata also contains extensive mention of the concept of Maaya (illusion) used in the sense of the divine illusion that deludes all the sentient beings giving them a sense of living in a universe. These references are found in Book 12 and 13 (Santi and Anusasana Parvas) which are huge philosophical discourses and well known as later additions. Some examples are as follows:- (12.47) Salutations to thee in thy form as Maya illusion! (12.231) Then the original Creator of all beings, having by his Maya divided Himself, enters that subtile form for surveying or overlooking everything. (12.248) Thou art concealed in consequence of being invested with Maya or illusion. (12.320) .. the seventeenth and the eighteenth principles called Prakriti and Vyakti ie, Maya and Prakasa. (12.320)… the four together viz, Purusha and his Maya and Jiva and Avidya. (13.17) consciousness endued with Maya. (13.149) …the deity that overwhelms the universe with His Maya (illusion).